The only difference between the control and experimental group is the independent variable. In an experiment, data from an experimental group is compared with data from a control group. These two groups should be identical in every respect except one: The difference between a control group and an experimental group is that the independent variable is changed for the experimental group, but is held constant in the control group. The control group and experimental group are compared against each other in an experiment. The only difference between the two groups is that the independent variable is changed in the experimental group. The independent variable is "controlled" or held constant in the control group. 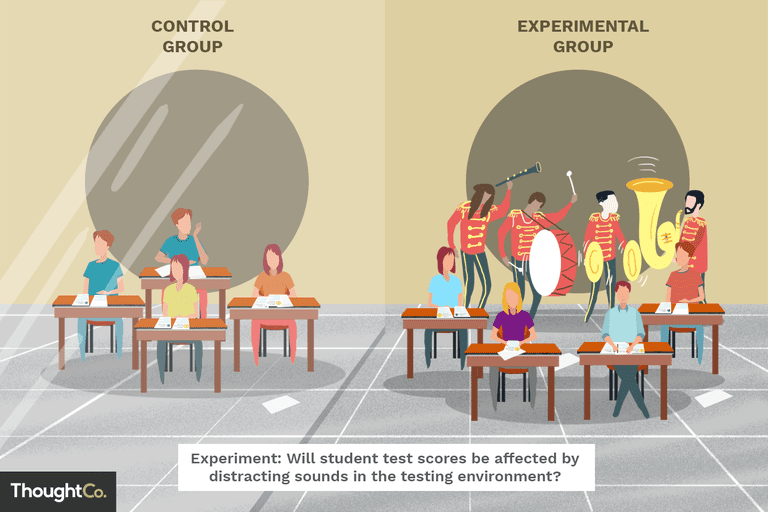 A single experiment may include multiple experimental groups, which may all be compared against the control group. The purpose of having a control is to rule out other factors which may influence the results of an experiment. Not all experiments include a control group, but those that do are called "controlled experiments." A placebo may also be used in an experiment. A placebo isn't a substitute for a control group because subjects exposed to a placebo may experience effects from the belief they are being tested. What Are Groups in Experiment Design? An experimental group is the group that receives an experimental procedure or a test sample. This group is exposed to changes in the independent variable being tested. The values of the independent variable and the result on the dependent variable are recorded. An experiment may include multiple experimental groups at one time. A control group is a group separated from the rest of the experiment such that the independent variable being tested cannot influence the results. This isolates the independent variable's effects on the experiment and can help rule out alternative explanations of the experimental results. While all experiments have an experimental group, not all experiments require a control group. Controls are extremely useful where the experimental conditions are complex and difficult to isolate. Experiments that use control groups are called controlled experiments. A simple example of a controlled experiment may be used to determine whether or not plants need to be watered to live. The control group would be plants that are not watered. The experimental group would consist of plants that receive water. A clever scientist would wonder whether too much watering might kill the plants and would set up several experimental groups, each receiving a different amount of water. Sometimes setting up a controlled experiment can be confusing. For example, a scientist may wonder whether or not a species of bacteria needs oxygen in order to live. To test this, cultures of bacteria may be left in the air, while other cultures are placed in a sealed container of nitrogen (the most common component of air) or deoxygenated air (which likely contained extra carbon dioxide). Which container is the control? Which is the experimental group? The most common type of control group is one held at ordinary conditions so it doesn't experience a changing variable. For example, If you want to explore the effect of salt on plant growth, the control group would be a set of plants not exposed to salt, while the experimental group would receive the salt treatment. If you want to test whether the duration of light exposure affects fish reproduction, the control group would be exposed to a "normal" number of hours of light, while the duration would change for the experimental group. Experiments involving human subjects can be much more complex. If you're testing whether a drug is effective or not, for example, members of a control group may expect they will not unaffected. To prevent skewing the results, a placebo may be used. A placebo is a substance that doesn't contain an active therapeutic agent. If a control group takes a placebo, participants don't know whether they are being treated or not, so they have the same expectations as members of the experimental group. However, there is also the placebo effect to consider. Here, the recipient of the placebo experiences an effect or improvement because she believes there should be an effect. Another concern with a placebo is that it's not always easy to formulate one that truly free of active ingredients. For example, if a sugar pill is given as a placebo, there's a chance the sugar will affect the outcome of the experiment. Positive control groups are control groups in which the conditions guarantee a positive result. Positive control groups are effective to show the experiment is functioning as planned. Negative control groups are control groups in which conditions produce a negative outcome. Negative control groups help identify outside influences which may be present that were not unaccounted for, such as contaminants. Bailey, R. A. (2008). Design of Comparative Experiments. Cambridge University Press. ISBN 978-0-521-68357-9. Hinkelmann, Klaus; Kempthorne, Oscar (2008). Design and Analysis of Experiments, Volume I: Introduction to Experimental Design (2nd ed.). Wiley. ISBN 978-0-471-72756-9.